The past two weeks our class has been working really hard to get a decent grasp of Autodesk Fusion 360. Because it is such an expansive and powerful tool- there is no possible way for us to master all of its features, but the goal is for us is to understand what can be done with the software, and develop a set of skills to make a basic 3D image from scratch. We’re all learning together exactly what can be achieved through the software - so now we’re just on the journey of figuring things out for ourselves. Some people in the class have had prior experience with 3D design software, so it was interesting to learn their take on a unique program. Nora talked about how it differs from software she’s used in the past like Inventor. For a little background on Fusion 360; it was first released two and half years ago - but has undergone dramatic changes in recent times. It is one of the first technologies for direct modeling to bring together organic yet complex form design. It was good to know that Fusion 360 stacked up well to its competitors. We have each put in at least ten to fifteen hours (minimum) with the program, and it would be painful to hear there was a software out there that would suit our needs better. 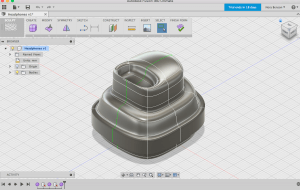 But because so many of us are beginners not only in 3D design, but to the whole 3D printing process in general, it really seems like Fusion 360 is the exact tool we need to learn to use. The first week during our introduction to Fusion 360 we had the privilege to hear a presentation by two Autodesk representatives, Jeff Smith and Chris Hall. They spent a solid three hours with us, helping us one on one, to design a lamp using the software. The amount of knowledge they possessed on 3D design was unfathomable to someone of my novice status, but listening to them talk about their careers in design was something I definitely appreciated. The skills and knowledge that we are gaining through this class are one-hundred percent applicable in today’s business world. Even beyond applicable- I would go as far to say they are actively sought after, and with the speed technology has been advancing at, I only expect that demand to sky rocket. For me, personally, I was able to navigate between the menus and viewpoints much, much easier the second week- and I also finally picked up the ability to customize measurements to an exact inch or millimeter- which proved incredibly handy when building more complex objects for personal use. My classmates were able to print and design some really awesome things the past two weeks, and I’m really excited to move forward from here and see what we are able to produce next!